The event, sponsored by World Horse Welfare and WOW Saddles, saw vets, saddlers and equine therapists rub shoulders with professional riders and trainers, as well as leisure owners and riders to hear eminent speakers share and debate their vast experience and landmark research. The programme explored the latest findings on health and welfare aspects of the horse and rider relationship, from new techniques in equine pain recognition to rider posture and equine biomechanics. With tickets for Nottingham’s 550 seat De Vere Conference Centre sold out well in advance, almost 200 took advantage of live streaming the event. A total of 23 countries signed up to the live stream, giving the event world-wide reach. Russell Mackechnie-Guire began the day by reminding the audience that all riders must take responsibility for their own fitness to ride and, with the help of registered practitioners, consider whether their horse, rider and saddle combination fits. If one or more of these components are wrong, we have a duty to the horse to do something about it. Dr Thilo Pfau discussed recent advances in inertial sensor-based asymmetry assessment, emphasising the importance of differentiating between measurement of movement asymmetry and the expert judgement about the presence and extent of any lameness. Identifying low-grade lameness can be challenging, with owners, riders and trainers appearing to have a poor ability to recognise signs of pain when horses are ridden. Dr Sue Dyson, described the development and validation of an ethogram based on 24 behaviours, which is designed to help recognition of pain in ridden horses. The tool can be highly effective, but training is needed for accurate interpretation of all features of the ethogram. Professor Lars Roepstorff spoke about his study on rider locomotion patterns and possibilities for improving rider skills, concluding that the ability to characterise the intersegmental postural strategies of the rider’s seat may enhance the possibilities to train body awareness and improve equestrian performance in the future. Structural and functional asymmetries are common in people and animals. Professor Hilary Clayton explained the structural and functional asymmetry of the equine athlete and the importance of distinguishing asymmetries in the horse’s movement due to sidedness from those arising from the trainer’s side preference, or as a consequence of mild lameness. Rider size in relation to the horse and the saddle was another topic raised by Dr Dyson together with Dr Anne Bondi, Laura Quiney and Professor Pat Harris. Research has shown how riders who are an inappropriate weight or size for the horse, in association with a saddle that does not ideally fit the rider, can cause temporary lameness, behavioural changes, back muscle tension and pain in the horse. While it has not yet been possible to conclude a definitive weight ratio for horse and rider given the many variables involved, it is clear that the saddle needs to be fitted to both the horse and the rider, and that it may not be possible to make this work for some combinations. Professor Heikki Handroos enlightened the audience about exciting new advances in horse simulator research and the potential to provide an effective way to learn advanced skills of riding with the help of robotics technology. In the afternoon a panel of key figures within the equine industry discussed research and the future from the perspectives of welfare and performance, the media, the sport’s governing bodies, the saddlery industry and the need for change and social licence. Olympic medal winning dressage rider, Richard Davison, summed up the day. 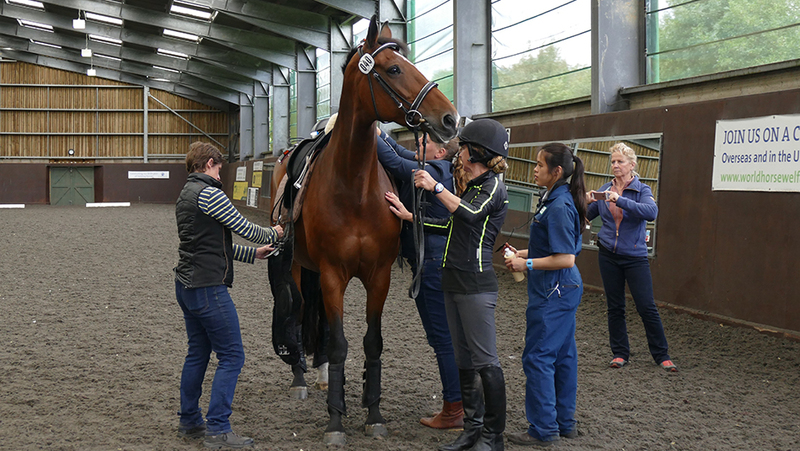 Featured image: A horse being prepared for ridden assessment, credit Dr Sue Dyson, AHT.